Brett Luke | The Journal Gazette Breanna Doughman and her mother Kricket cheer on the Mad Ants along with the other Madame Ants Friday night at Memorial Coliseum. 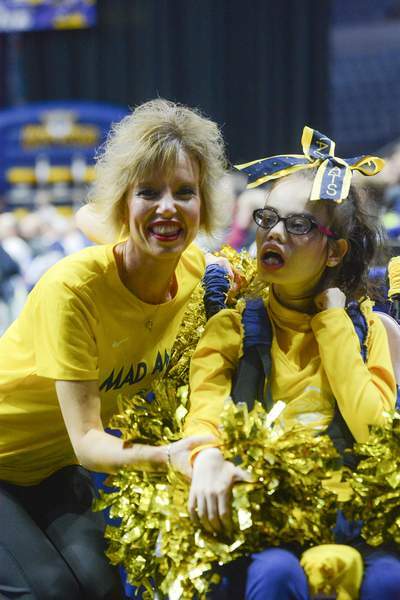 Anyone who has been to a Mad Ants game has probably noticed the girl in a wheelchair, accompanied by her mother, who cheers along the sidelines and with the Madame Ants dance team. They were honored on the court tonight, and received a standing ovation, as part of a great presentation at Memorial Coliseum. The girl, Breanna Doughman, and her mother, Kricket, have been part of the Madame Ants for three seasons. They practice with the Madame Ants and participate in all the home games. Breanna has a rare neurological disorder that affects mostly girls, called Rett Syndrome, which can affect almost every aspect of a child’s life, including their ability to speak, walk, eat or even breathe. She can't participate like most cheerleaders, of course, but you can tell she loves being a part of this. They will be at Bankers Life Fieldhouse on Sunday, invited by the Indiana Pacers, who own and operate the Mad Ants. Breanna was presented with a new electric wheelchair tonight by Jim Ham, Charlie Maroney and Dale Walker from Stoops Freightliner. They apparently took it upon themselves to do this and were honored by the Mad Ants for it.